^ Pleistocene Homo sapiens from Middle Awash, Ethiopia (PDF). Nature: 742–747. ^ Rightmire, GP. Out of Africa: modern human origins special feature: middle and later Pleistocene hominins in Africa and Southwest Asia (PDF). Proc Natl Acad Sci U S A. 2009, 106 (38): 16046–50. PMC 2752549. PMID 19581595. doi:10.1073/pnas.0903930106. ^ "In North America and Eurasia the species has long been an important resource—in many areas the most important resource—for peoples' inhabiting the northern boreal forest and tundra regions. Known human dependence on caribou/wild reindeer has a long history, beginning in the Middle Pleistocene (Banfield 1961:170; Kurtén 1968:170) and continuing to the present....The caribou/wild reindeer is thus an animal that has been a major resource for humans throughout a tremendous geographic area and across a time span of tens of thousands of years." 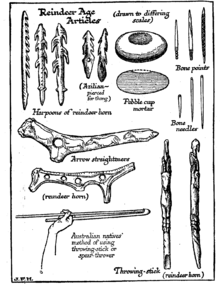 Ernest S. Burch, Jr. "The Caribou/Wild Reindeer as a Human Resource", American Antiquity, Vol. 37, No. 3 (July 1972), pp. 339–368. （英文） Zdeněk Burian - Upper Paleolithic large color images.